Provocations is something we all experiences, it be by accident or it being deliberate. A thoughtless word spoken in the wrong moment or the rash action we give to the world on a bad day can invite conflict. Sometimes people provoke some sort of reaction because they feel bad about themselves or they suffer from envy. At other times it is to measure strength or they seek to win an argument so they can feel better about themselves or the philosophy they took as a compass in their life. There is no limit to what can provoke us and therefore, instead of entering the negative energy of a provocation it is better to take a step back and see what we can do with the provocation. For Oscar Wilde the answer to a provocation was to repay it with kindness, because nothing would provoke more than this. 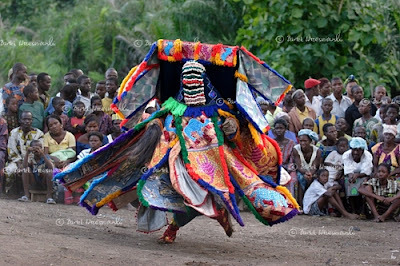 This is a good attitude to hold when confronted with provocations in general, because if we see the battle as a dance where we ‘hit’ our provocateur with ‘dry leaves’ we might teach a lesson – and gain a lesson, but we should also keep in mind that dance amongst the Yoruba people are seen as cosmic movements. Dance can enact the movements of stars, it can bring disorganized life back into harmony and it can be used as divination or as a vehicle for diagnosis of illness. Ultimately, dance holds the power of healing and a healing dance is performed by people who possess iwa rere – a joyous and calm character. It was with this attitude Ogun entertained Obara’s challenge, knowing that he was older, wiser and stronger – still, we are all together in the dance of life, in this market that is our journey. Ogun understood this and embraced the challenge with interest and joy and not as a battle. This is certainly an attitude more worthy when confronted with provocation – in fact this attitude have a Socratic spin to it and in this aims towards widening of horizons of understanding more that proving a point or defining who is right and who is wrong. The battle turns into a dance of word and opinions mutually stimulating and rewarding – and in this the cosmic dance of joy and harmony is replicated. Ase O!